Whenever we’re meeting an artist for the first time it’s cause for celebration, especially if the artist in question is going to play part in shaping rock ‘n’ roll for the foreseeable future. I can envision the reactions to that statement already. A quick scan up the page to double check the artist’s name, thinking you might’ve misread it at first glance, then a quizzical look starts to come over your face, one eyebrow cocked, your lip curling ever so slightly and maybe a quiet “HUH?” escaping from your throat. The Blenders? A lasting impact on rock? I never even HEARD of them! Well, if that WAS your response – and you don’t have to admit it if it was – then you’ve come to the right place, because while The Blenders as a group might not have made a name for themselves in the annals of rock history, some of their members wound up having a much bigger hand in the evolution of rock ‘n’ roll over the next decade than is widely known. This however is where that story begins. Actually, I’ve already lied. This ISN’T where their story begins even though it’s the first time on these pages we’ve mentioned any of them. Their story starts with The Ravens in the days before rock ‘n’ roll came along to give them a permanent home. That group who we’ve come to know so well over many reviews actually began with different membership. Instead of their high tenor co-lead Maithe Marshall they had in their ranks a tenor named Ollie Jones. Though a good singer, he wasn’t a good fit with the group. He’d cut some records with them on the small Hub label but in early 1947 they replaced him with Marshall and their career took off over the next year. You’d think Jones might be mad about this, swearing vengeance, maybe poisoning their birdseed, but no, it was an amicable parting. Jones was still friends with them all and he being a songwriter as well knew the importance of having the right voices to put your songs across. Jones joined another (non-recording) group for 1948 but they split up in early 1949 and by now he’s got to be getting frustrated when assessing the musical landscape. Here’s this music, rock ‘n’ roll, which is growing exponentially during this time and yet the vocal group realm in rock, led by his old pals The Ravens, is still pretty sparse. The Orioles had come along and offered a much different style to contrast with them and in spite of those two groups enormous success you’ve only had a few others drop in for a record or two, but other than The Robins, who’d only recently arrived on the scene, it’s still a wide open field. He had to know it wouldn’t stay that way for long, not in an industry where record companies are desperate to jump on any trend that shows promise. So Jones formed his own group, The Blenders, who not only were modeled on The Ravens but which The Ravens themselves, specifically Jimmy Ricks, got them a recording contract for the same label – National – that they were on at the time. Of course The Blenders were hampered by the fact that as good as their own bass singer James DeLoach was (Ricks had given him his stamp of approval when they were forming and Jones asked for his appraisal) he was obviously no Jimmy Ricks. We already know Jones had been dropped for Maithe Marshall in The Ravens and we also know The Blenders other tenor Abel DeCosta wasn’t quite in Marshall’s league either, though they both were more than creditable when compared to mere mortals. So you had a group that was, no matter how looked at it, a second rate Ravens outfit, something which would be all the more apparent if they were going to be cutting Ravens-styled songs in Ravens-styled arrangements on the same label The Ravens recorded for! This probably wasn’t going to be a very flattering comparison. But when you’re talking about a group as prodigious as The Ravens, even a second rate Ravens-type act had the potential to be pretty decent as Come Back Baby Blues definitely shows. What this release ALSO shows is that National Records, or the group themselves, were taking their Ravens prototype to the extreme, because as we’ve bemoaned more times than we care to remember, it was common for The Ravens to release straight pop material led by Marshall alongside their Ricks-led rock cuts. That’s the case here as well, as Tommy Adams, the baritone in the group, takes the lead on a pleasant but square version of the standard I Can Dream, Can’t I?. I, for one, dream of a day when rock vocal groups will stop trying to pretend they’re The Ink Spots and be content to be genuine stars in the rock world for a fan-base that adores them rather than settling for being middling nightclub acts aiming at pleasing indifferent audiences who, if the singers weren’t on stage, would probably expect them to shine their shoes or fetch their jacket. Come Back Baby Blues is their entry into the rock kingdom. That they’re directly competing with one of the rulers of that kingdom makes their task of standing out a little more difficult but on the other hand they have an already successful formula to guide them. So ultimately it just comes down to execution. Musical arranger Herman Flintall’s piano leads it off before James DeLoach’s bass enters in impressive fashion. He’s got a really strong resonant voice, not merely somebody thrown in a part they’re ill-suited for and told to somehow come close to replicating the greatest performer in that role who ever lived. He’s no Ricky but he’s got enough talent to put most basses to shame. The problem is it’s all too familiar. It’s not a FATAL flaw, but it’s obvious they didn’t trust their own ability to craft something entirely new. They wanted you to think this was simply The Ravens under a different name, especially as it was on the same label. The lyrics even drop in lines explicitly referring back to The Ravens hits Write Me A Letter and Send For Me If You Need Me. They weren’t exactly being subtle about it in other words. But that only means their already difficult job becomes harder… or does it? We’ve talked at length about The Ravens predilection for leaning pop, not only with songs geared entirely for that market but also how far too often they’ve shaded their rock output with pop sensibilities, particularly in the Marshall-led bridges. But not The Blenders, not here, not now, not on their very first record where if ever there was a time to acquiesce to record company demands or the prevailing mindset that – in spite of two years of evidence to the contrary – pop is still the way to go. They went in the other direction. The rock direction. Now to be honest, it’s not as if they’re causing a riot with their singing that’s going to result in multiple felonies being committed under the influence of the song. It’s still fairly sedate sounding, but it’s not smoothed over pop sounding and that’s an important distinction to make. For starters the others sing the interludes in harmony, not hand it over to just one other vocalist to deliver, as The Ravens do with Marshall and The Orioles for that matter do with baritone George Nelson. 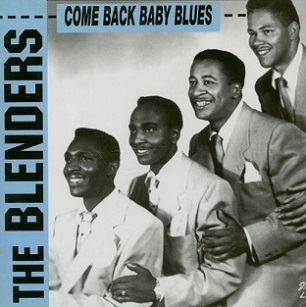 The Blenders emphasize the entire group in a way that’s refreshing. Not only does it reinforce the idea that they’re all important and in this endeavor together, but it lends itself to the song in a way that a lone voice can’t do in the same manner. You listen for the interplay, you pick out the specific tones, you hear the blend. Their wordless “Doo-doo-doo-doo-doo-doo-doo’s” are like a low flying cloud they hop on as it carries them along. When they sing actual words DeLoche joins them, his bass out front but clearly working well in the group context. Where he struggles just a bit is in the standalone sections, not all of the time, but he tends to lose power in longer passages, making it an issue with breath control, something Ricks never has to deal with it seems. But at his best DeLoach has got both the gravity and the lightness of touch to make it far more than just a shockingly deep voice acting as a gimmick. He’s invested in the lyrics, conscious of his phrasing and knows how to emphasize the lines to their fullest advantage. That may sound like pretty basic stuff that ALL singers should know, and it is of course, but the risk when you’re looking for a strict imitator rather than an originator is that those standard measures of delivery are deemed less essential than the ability to merely hit the low notes themselves. The Blenders found themselves somebody who can do both – act as a reasonable facsimile of somebody else while also not losing sight of the fact he needs to be just as convincing with what he sings as how he sings it. Though Come Back Baby Blues doesn’t aim high at all – the storyline is a basic run-through of one already done by others, its instrumental accompaniment is suitable but hardly memorable and even its vocal arrangement is by the numbers, what you’re impressed by is how easily this could’ve become a transparent hack-job that did nobody, not National Records, not The Blenders and not even The Ravens, any good. Instead it can stand on its own as a pretty decent record. Is that lowering the bar for what expected around here? Probably. Okay, definitely, at least in one respect. We’ve constantly preached originality and this certainly is anything but original, so had this been a Ravens record with the advantages of Ricks in the lead role, and let’s say the others following THIS outline and not reverting to a weaker pop-slanted backing, then it’d have gotten an even higher score than this will receive. But when you’re putting yourself in a situation where you can’t possibly look good by comparison… and then come out looking pretty damn good anyway… it’s kind of hard not to be pleased by that outcome. Ultimately music fans want good music. If The Ravens were going to give them everything they could possibly want in this regard maybe The Blenders addition to the vocal group canon in the exact same mold wouldn’t be necessary or appreciated. But when the established group still is wavering in their commitment to rock at times, leaving you never sure if they’ll toss you overboard for someone with more class than you’re deemed to have, then another group who might pick up that slack is a welcome sight, if only for the possible kick in the tail feathers they might deliver to their more acclaimed forebearers. Besides, early in the review I mentioned how the guys in this group would go on to leave a more lasting mark on rock ‘n’ roll than merely the results of THIS song. For some reason National didn’t hold on to them after this and so they’ll soon move on to major label where they’ll continue to pursue rock fairly consistently. Down the road they’ll even go on to cut the first X-rated underground record of note, one which has become very well known in certain circles since (obviously it wasn’t released at the time). Most notable however was Ollie Jones, the once upon a time Raven and the founder of The Blenders, met up with Atlantic producer, arranger, songwriter, all-around genius Jesse Stone in 1954 and it was he who told him of the need for reliable vocal groups to do session work behind solo artists. Since The Blenders recording opportunities were drying up and the group had some turnover in their personnel, Jones and fellow Blender Abel DeCosta broke off and formed The Cues, a group that acted as (mostly) Atlantic’s in-house vocal group for the next few years. Jones, a songwriter from the start remember, wound up writing a lot of important songs at that time as well, meaning that while The Blenders themselves were only moderately successful and none too important in the big scheme of things, their real importance was in precipitating the growth of a style of rock that would thrive over the next few decades. That’s not bad for a bunch copy-cats and neither is this record, derivative though it may be. 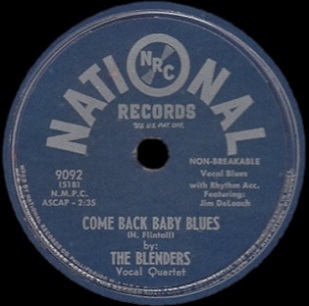 Leave a reply on "The Blenders: “Come Back Baby Blues”"